Nelson Henry Baker was born on February 16, 1842. He was the second of four sons (Lewis P., Nelson, Andrew and Ransom) born to Lewis and Caroline (Donnellan). At birth, Father Baker was baptized in the Lutheran faith, the faith of his father. When Nelson was 10 years old, under the spiritual influence of his devout Catholic mother, he was rebaptized in the Catholic Church. As a child, Nelson loved to accompany his mother to Mass. The family lived in the small, but growing, city of Buffalo, New York. 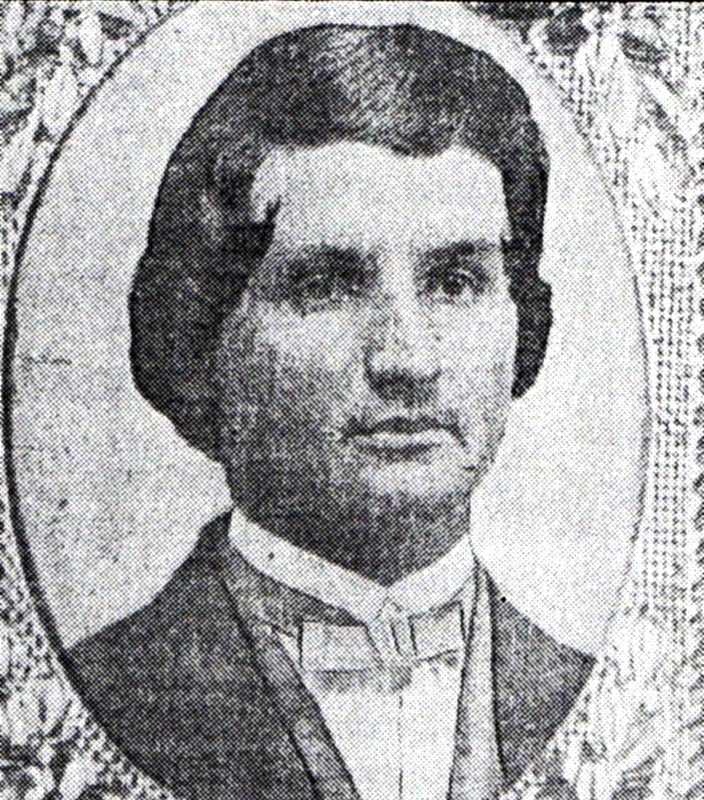 Lewis Baker was a retired mariner who took advantage of the increased commerce that the opening of the Erie Canal brought to the Great Lakes region and became the proprietor of a grocery and general store in Buffalo's downtown. As was customary in those days, the family lived behind the store. While there is not a lot of official documentation that exists from Nelson's childhood, it seems to have been a happy time for him. After graduating from high school, Nelson joined his father and older brother working in the store. He was bright, good with figures, outgoing,and with a wide range of interests. His future looked promising. Then the American Civil War broke out. In June 1863, General Robert E. Lee and his Confederate army had moved into southern Pennsylvania. Fearful that the enemy would soon reach New York, the state called for 20,000 new recruits. On the evening of Nelson's enlistment, he and his fellow recruits were sworn in and boarded the train for Harrisburg, Pa. Nelson's regiment, the 74th New York, served with bravery and distinction there, protecting bridges and an aqueduct as the Confederate troops were forced to retreat. The term of enlistment was only 30 days and the men of the 74th were expected to return to Buffalo in mid-July, but a dire emergency arose in New York City when rioting mobs began to cause havoc. Nelson and his comrades spent two days there, and, together with several other companies of the state militia, were successful in quelling the riots. On July 21, 1863, the members of the 74th Regiment returned to Buffalo. Once home, Nelson settled into his old routine, working in his father's store. Around that time, his friend Joe Meyer approached him with a proposal. Joe wanted to open a feed and grain business with Nelson to take advantage of Buffalo's booming economy. Nelson accepted, and Meyer and Baker, a profitable and successfully endeavor for many years, was born. During the years that Nelson ran the business with Joe, he was most generous with his time and money to a local Catholic orphanage. He felt that God had been so good to his family and himself that he wanted to give back. Becoming a priest had crossed his mind from time to time, but he was getting older now, and he knew that he had not had the proper schooling to prepare himself for the seminary. Each time the yearning came over him, he dismissed it — but not entirely. One day as Nelson was returning from a buying trip, he came upon two boys carrying a heavy sack. He stopped his horse and wagon and asked them where they were headed. Their answer: "Limestone Hill, St. Joseph's Orphanage." Nelson agreed to bring the boys to their home and, while there, he stopped to see Father Hines, the administrator, with whom he was well acquainted. One thing led to another, and, before the visit ended, Father Hines promised to recommend Nelson to the Bishop for admission to the diocesan seminary. For the next year, the Nelson worked furiously - helping Joe at the store all day and studying Latin at night. By June, 1869, he was exhausted and ill. To get some needed rest, he embarked upon a steamer excursion around the Great Lakes. At every stop, he earnestly prayed and meditated on the question of his vocation. When he returned to Buffalo, his mind was clear. The first person to hear the news was his mother, who confessed that she had prayed secretly for years that he would become a priest. Joe Meyer was devastated at losing his partner, but Nelson, showing the resourcefulness that would serve him so well in his priestly life, already had a solution to that problem: his younger brother, Ransom, took over. So it was that on September 2, 1869, Nelson Baker ended one chapter of his life to begin a second one in service to Our Lord. 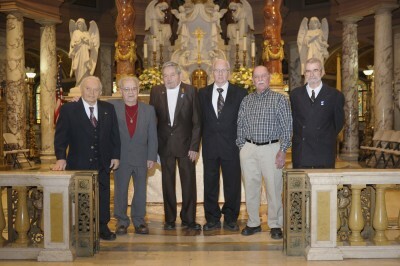 Although he was almost 10 years older than most of his fellow seminarians at Our Lady of the Angels Seminary in Buffalo, the future Father Baker fit in admirably with his classmates. He assumed a leadership role from the start and academically excelled, achieving high grades in most of his studies. In November, 1871, Nelson became gravely ill. So much so that he received Extreme Unction and was expected to die. After nearly a full year of being sick, he was able to recover. Better yet, he was accepted into the major seminary and told to "get his cassock and report to the seminary the first Wednesday in September." Early in the year 1874, Nelson read about a pilgrimage to some of the great Catholic shrines of Europe. He approached the seminary rector with the possibility of going at his own expense as the representative of his seminary. Permission was granted and Nelson left in May. One of the several shrines on the agenda of the pilgrims was that of Our Lady of Victories in Paris. There, Nelson felt a special tug on his heart during Mass. Although the pilgrims later visited Lourdes, the tombs of the Apostles in Rome, St. Peter's and the Holy Father in Rome, his mind kept returning to the wonderful shrine in Paris and the possibility of honoring Our Lady in the same way in America. 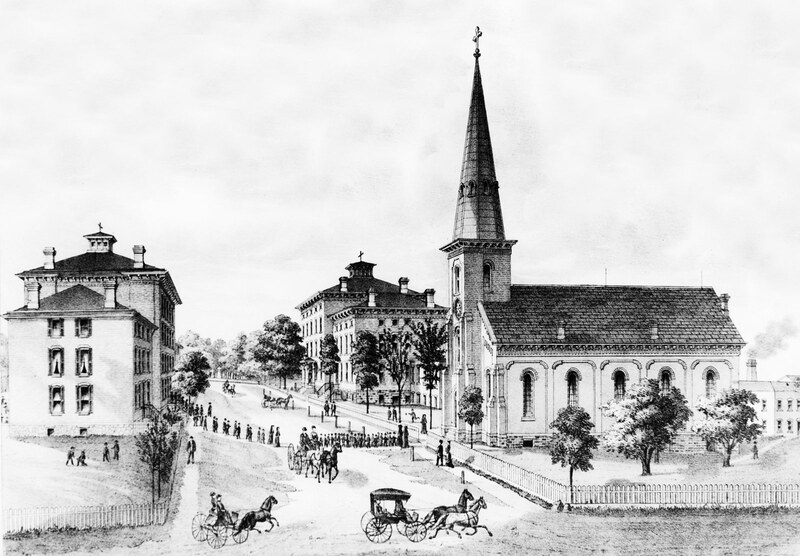 When he returned home in July 1874, Nelson continued his studies at the seminary. 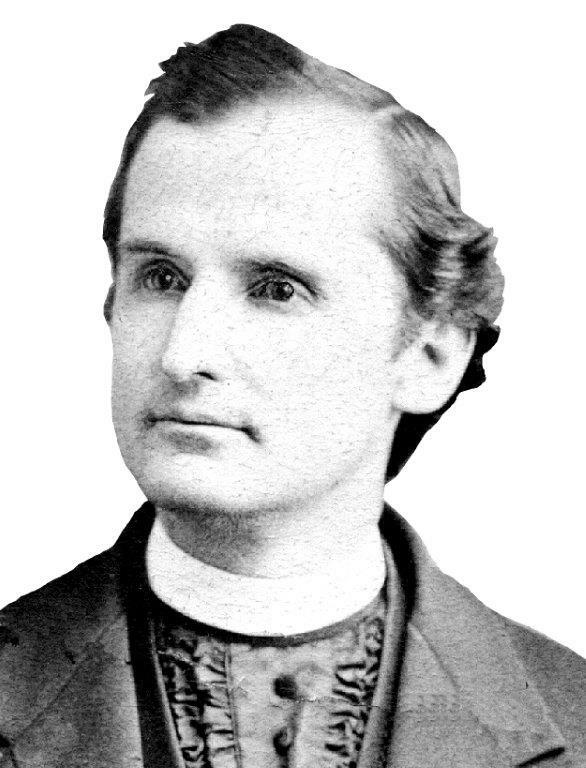 In March of 1876, he was ordained to the diaconate. Soon thereafter, Nelson Baker became a priest of God on March 19, 1876 — the feast of St. Joseph — at St. Joseph's Cathedral in Buffalo. Father Baker was shocked at his first assignment from the Bishop -- he was appointed assistant superintendent of the institutions at Limestone Hill under his friend Father Hines. The Bishop wanted Nelson there because of his business sense and his organizational ability. 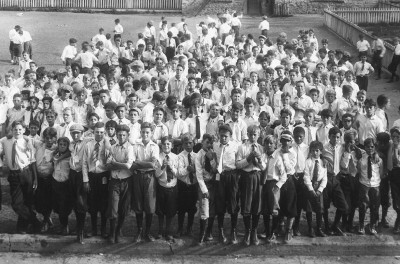 When Father Baker arrived in 1876, St. John's Protectory (the facility that cared for older boys) and St. Joseph Boys' Orphan Asylum (for younger boys) had a combined debt of $27,000. By 1881, the debt had risen to more than $60,000 -- an impossible sum in those days. Father Baker thought the situation completely hopeless, and, as a result, asked for, and was granted, a transfer to a parish in Corning, N.Y., then part of the Diocese of Buffalo. After one year there, Father Baker was summoned by Bishop Ryan to return to Limestone Hill as Father Hines' replacement. He would not leave again. Though he was concerned about the substantial problems facing him at Limestone Hill, Father Baker jumped into his new assignment with all the enthusiasm his spirit could muster. Immediately he was confronted by several creditors who were owed large sums of money. He was blunt. He asked them if they would be willing to take partial payment now and wait for the rest. All but one refused the offer. Then he climbed into his buggy, drove to the bank which held his personal savings and withdrew every penny he had to his name to pay off the debts. At about this time, Father Baker got the idea to form the Association of Our Lady of Victory, a fundraising initiative that would transform his organization (and many others around the U.S.) forever. Father Baker sat down every evening and hand wrote hundreds of letters to postmasters all over the country asking them to send him names of charitable, Catholic women in their cities and towns. As these names came in, he wrote these ladies, appealing to their sense of charity on behalf of the boys in his care. He asked for one quarter a year in membership dues. The Association was an unqualified success! In a few years' time, not only did Father Baker pay off his debts, but he was able to begin much-needed building projects — a new, larger chapel and additions to the two institutions. During the early 1890s, natural gas had been discovered in the Buffalo area and across the border in Canada. Late one evening, as Father Baker sat in his office paying the enormous heating bills for his growing institutions, his thoughts turned to the possibility of drilling for gas on the property. According to local experts, the natural gas supply in the area was limited. His solution? As usual, when he had to make a major decision or needed a favor, he spent the night in prayer before the statue of Our Lady of Victory that he had brought from France. After some days of praying in this manner, Father Baker approached the Bishop about the idea and to seek a loan to start the project. Recalling that Father Baker had many times seemed to pluck money out of thin air, His Excellency reluctantly agreed. When the drillers arrived with their equipment, the foreman asked Father Baker where they were to begin drilling. His team was amazed when a huge procession of altar boys, Sisters, Brothers, and Father Baker exited the church carrying candles and praying the Rosary. They processed into an open field until Father stopped, sprinkled the ground with holy water, took a small statue of Our Lady out of his pocket, dug a hole in the ground, buried the statue, and told the workers: "Drill here, but try not to disturb the statue." Several days later, the project had yet to bear any fruit. Residents of Limestone Hill began to refer to the drill as "Father Baker's Folly." Money was running out and Father Baker had to approach the Bishop once more. Bishop Ryan agreed to provide him with additional funding, and at an unheard-of depth of 1,137 feet, the well, dubbed "Victoria Well," came in! The pool struck that day yielded enough natural gas to heat all of Father Baker's buildings, provide gas for cooking and to even heat the homes of about 50 families nearby. Amazingly, the well is still producing today. Around the turn of the 20th century, Father Baker read in the newspaper of a nearby section of the Erie Canal that had been ordered to be dredged in order to deepen it. During the process, workers found the bones and bodies of infants and small children. The supposition was that unmarried women who had given birth and who had been banished in disgrace from their homes threw their newborns into the canal to drown, thereby ridding themselves of the burden of raising their "mistake" in poverty. Horrified and called to immediate action, Father Baker set his will to a new project. OLV Infant Home would provide a sanctuary for unwed mothers and their babies. Anyone was welcome and no questions were asked -- if a mother did not want to keep her infant, there was a crib and a blanket always set next to the unlocked door of the home, so she could deposit her child there during the night. Amazingly, many of the locals disapproved of the situation, saying that the mother needed to "pay" for her immorality by having to live and raise her child in poverty. Naturally, Father had no patience for such hard-heartedness. 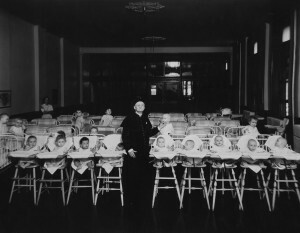 After construction was completed in 1908, and the facility filled to capacity, it became one of Father Baker's favorite places. His nightly rounds always ended at the Infant Home where he was often found tucking in little ones, blessing them all on his way out the door. The organization continued to grow in size. The next large-scale building project was the addition of a maternity hospital which was completed in 1919. Later, as the community's needs changed, the structure was converted to a 275-bed general hospital. For many years, Father Baker had dreamed of a fitting tribute to his patroness, Our Lady of Victory. His parish had grown, and the church was unable to hold the thousands who flocked to his Masses. Each time he thought he could begin, some emergency arose or a new building project took precedence, and an expansion of the existing church was delayed. At last, in 1921, when Father Baker was 79 years old, he felt he could begin. The Institutions were running as smoothly as expected and it appeared the time had come. He reached out to a renowned architect, Emile Uhlrich, and a local contractor, Edward Jordan, and plans became to form. To help finance the project, Father Baker turned to his beloved Association of Our Lady of Victory and its charitable members, now numbering in the thousands. In August of that year, Bishop William Turner helped lay the cornerstone. The magnificent church was finally completed by May of 1926, and true to Father Baker's word, not a nickel was owed on it! Upon the shrine's completion and dedication, the Holy Father, Pope Benedict XV, elevated it to the dignity of a basilica in a ceremony held October 3, 1926. 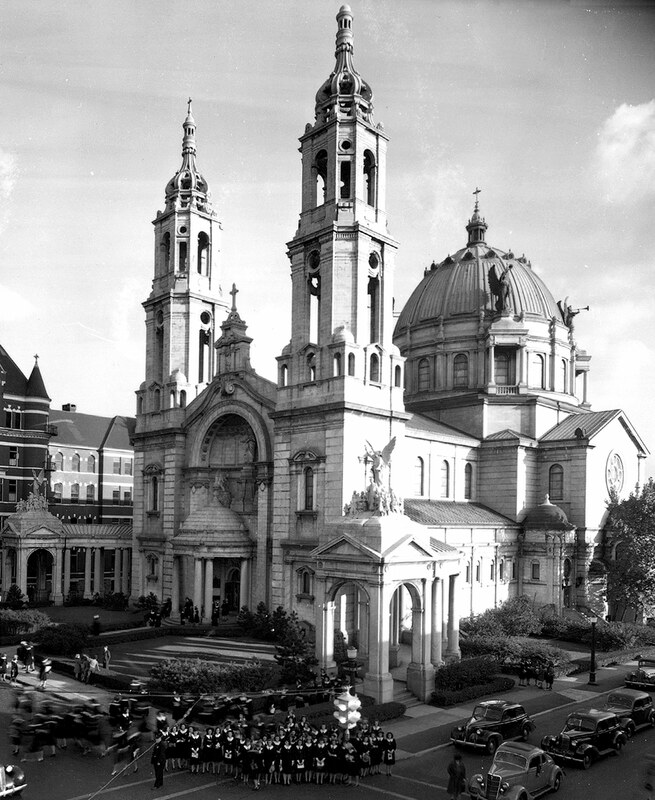 At the time, it was one of only two "minor basilicas" in the United States. The Wall Street Crash of October 1929 ushered in the Great Depression, years that scarred the nation and its people. Thousands were left destitute, hungry and/or homeless. Western New Yorkers were not immune to the suffering. For many of them, though, a hero arose: Father Baker. Entering his 90s, Father Baker's body began to slow, but his mind was sharp and filled with ways to assist those in need. Those records that have been left behind from that era tell a story of a bustling "City of Charity" that did more good than could be imagined. Diocesan records from the first three years of the 1930s, estimated that the Father Baker's Institutions had served more than 450,000 meals during these dark days. Eventually, age caught up with the man who was dubbed the "Padre of the Poor" by local newspapers. His health had deteriorated during the first part of 1936, but his mind remained alert until he finally lapsed into a coma on July 29. He breathed his last that morning while being blessed by Father Joseph A. Burke, an orphan raised by Father Baker himself, who would later go on to become bishop of Buffalo. Father Baker's 60 years in the priesthood were spent sheltering the homeless, feeding the hungry, caring for the sick and giving hope to the destitute. His legacy lives on today as Our Lady of Victory Homes of Charity and Baker Victory Services, which provide many of the same kinds of charitable services Father Baker began decades ago. In 1987, Father Baker's Cause for Canonization began when he was named a "Servant of God" by the Vatican. In 1998, the Congregation for the Causes of Saints in Rome recommended that his remains be moved into the basilica from nearby Holy Cross Cemetery. The next year, on March 10, his coffin was unearthed and re-interred in the church. On January 14, 2011, Pope Benedict XVI named him Venerable Nelson Baker. Those connected to his cause remain in close contact with Vatican officials and believe that someday soon Father Baker will be named Blessed.